Stock or custom concrete stencils: Which type fits your design needs? 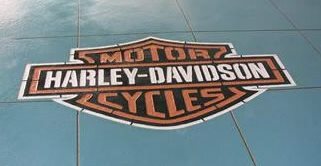 Creating a complex design or intricate logo on a concrete floor takes the skills and tools of the pros. An adhesive stencil can make all the difference in the final result. Over the years we have seen a lot of great stenciling projects. Here are some great examples of concrete work created using stock and custom adhesive stencils. 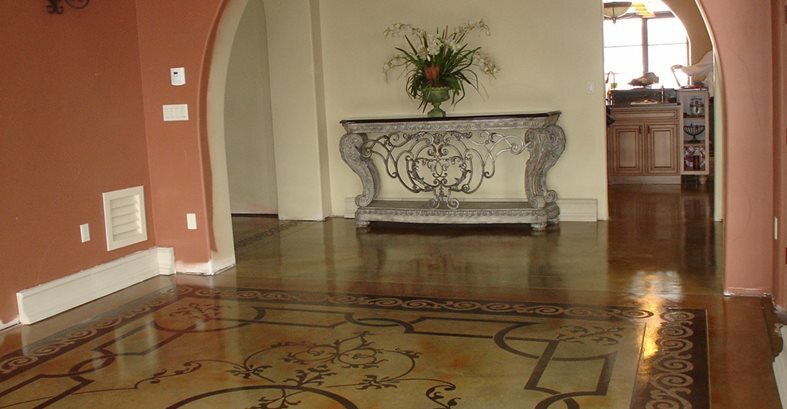 The floor in this upscale consignment shop was resurfaced with a decorative concrete overlay. Adhesive stencils from Modello Designs were adhered and colored with stains and dyes. The understated stenciled accents and borders add sophistication to the design. -- Project submitted by Don Pinger, Custom Concrete Solutions, West Hartford, Conn. This home's dining room floor was stenciled to look like an area rug. A Modello stencil was applied and dyes were used to create the design. The end result is definitely a conversation piece. -- Project submitted by Lorena Herriot, Image-N-Concrete Designs, Larkspur, Colo. The entryway of this home was stenciled using a Flattoo from Surface Gel Tek. The homeowner had requested an image from a bottle of Sammy Hagar tequila, which the contractor had turned into an adhesive vinyl stencil. Colormaker dyes were used because they are quick-drying and less likely to bleed. -- Project submitted by Evan Lloyd, Solid Solutions, Fresno, Calif. This logo was stenciled for a company specializing in parts for Ford Mustang's. They wanted their logo on the floor at the entrance to their facility. A custom Flattoo stencil was applied and then the logo was colored using Smith Paint stains. -- Project submitted by Tony Victor, Stone Roots, Inc., New Cumberland, Penn. Template Gallery Thousands of cut ready designs. Engrave-A-Crete Templates Custom designs available. 100% recyclable.